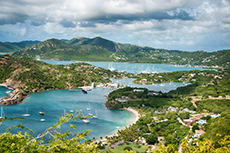 The largest of the British Leeward Islands, Antigua boasts one of the Caribbean's most spectacular coastlines with secluded coves and sun-drenched beaches. 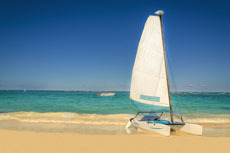 Sail the clear waters in a catamaran for a truly unforgettable day. 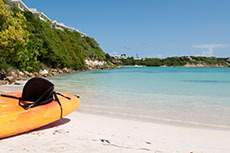 It's one of many choices of water activities while on the island! 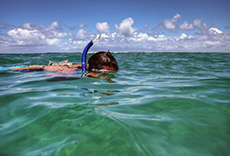 The reefs off the shore of Antigua contain many nooks and crannies for you to explore. 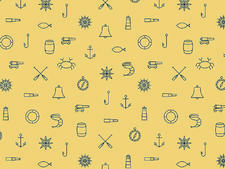 Look for interesting marine life like the parrotfish, angelfish, damsel fish, and grunt. Originally built as a signal station to alert troops of approaching ships, this breathtaking spot features commanding views of the English Harbor and Nelson's Dockyard. 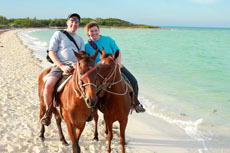 Gallop on the sparkling white sands while you tour around the coastline of Antigua. 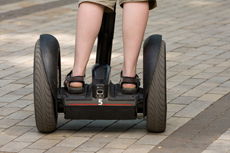 Explore this magnificent island on the most unique vehicle around, the segway. Public Market Complex: In the morning, check out the goods at the junction of Market Street, Valley Road and All Saints Road, to the south (or right, if you've just gotten off a ship) of Heritage and Redcliffe Quays; take the right-hand fork at the striking monument of first Antiguan Prime Minister V.C. Bird. There's a separate fish market, then farther along you'll find a hall selling fresh produce. Farmers fill the bins by 5 a.m. with the bounty from Antigua and surrounding islands. Ask for one of Antigua's small "black" pineapples (they're actually dark green when ripe). Next to the fruit market is the small crafts market with beaded and shell jewelry, leather sandals and other goods. Unlike many markets, where crafts are just resold, artisans work there. Historic Nelson's Dockyard: The only continuously working Georgian-era dockyard in the world is located in English Harbour, a natural "hurricane hole." Nelson's Dockyard was a major repair port for the British Royal Navy as far back as the early 18th century. Architectural remnants of the dockyard and its buildings rest side by side with impressive sailboats and yachts visiting from around the globe. The idyllic site is home to boutique hotels, restaurants, shops, galleries and a museum, all in tastefully repurposed historic structures. Placards describe how the buildings were originally used and provide a picture of life in the dockyard's heyday, when British naval legend Horatio Nelson was stationed there (it wasn't named after him until modern times, though). From St. John's, you have to cross the island to reach the dockyard; allow 30 minutes by taxi. You can negotiate with your driver to wait or grab another cab when you're ready to leave. The No. 17 bus also will get you there and back from downtown St. John's (see Getting Around). Take a Hike: Stretch your legs and get some great views. A number of trails can be found around English Harbor, some of which lead you along beaches and up to Shirley Heights -- such as Carpenters Rock Trail. 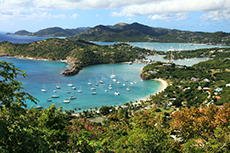 Barbuda: Hop onboard a catamaran for a day trip to Antigua's sister island. Barbuda is 28 miles from Antigua, and it's about a 90-minute trip each way (though rough seas can extend the journey). Barbuda is famous for its unspoiled beaches and frigate bird sanctuary. Ferries only make the roundtrip once per day (with no sailings on Mondays or Wednesdays), so be sure the schedule is a fit with your ship's all-aboard time. Best for Peace and Quiet: Arguably the most beautiful beach on the island, Valley Church Beach has white sand, sparkling clear water and just one beach bar. The shallow slope also makes it good for children. It's located south of Jolly Harbour, off Valley Road (look for a sign advertising the Nest), about 20 minutes from St. John's. Best for Hanging with Locals: Pigeon Point Beach, near English Harbour, has showers, restrooms, a playground and a beach bar serving casual food. It's also not a bad spot for snorkeling. No wonder residents like to hang there. Best for Active Sports: Jabberwock Beach is a great place for wind surfing and kite surfing; wind conditions always seem to be ideal, and lessons are available. Or just lie on the beautiful mile-long strip of white sand and watch the aerial acrobatics of those surfers. Best for a Lively Scene: If you like your beaches complete with restaurants, bars, resorts and hair-braiders, Dickenson Bay is your spot. It's about 15 minutes north of St. John's.